IS HPLC A RELIABLE METHOD FOR TESTING KRATOM? For some reason, this is a question we’ve been asked increasingly often recently. I’m not sure if clients get results that were different than they hoped or expected is the cause, or if it’s something else entirely. To answer part of this question, one of the many things we lab nerds do behind the scenes at the lab, is spend a great deal of time running every scenario we can think of, to try to break the testing methods we use. For example, many have asked if there is a wide range of alkaloid content between boxes of material, or within a single box or package of material. A common box size seems to be 25kg. We don’t personally have the resources or the luxury to have ten 25kg boxes lying around to take a sample from each box, but we have clients who do. We also don’t have a single 25kg box laying around to pull samples from different layers of that box to test. The short answer is that HPLC has been proven, in the published scientific community to be an extremely reliable and accurate way of testing for alkaloid content in Kratom. Despite numerous published papers that have outlined, in detail, the methods used to obtain reliable and repeatable alkaloid content in Kratom, we have personally spoken with a couple of the scientists who have had peer reviewed and peer published papers, asking about the mechanics behind alkaloid extraction, sample prep, and whether or not there are such things as alkaloids that are resistant to extraction, whether if something that was extracted with water will give an incorrect result if it is extracted into ethanol in the lab for testing in the HLPC, or various other scenarios. What we get is a very tech-heavy nerdy response (we’re all lab nerds here), that outlines the laws of physics, the elution process, and the behavior of mitragynine in various scenarios. We’ve been assured, not only by the numerous published methods for testing alkaloid content in Kratom we’ve replicated in our lab and then repeated, but by a couple of the scientists crafting those scientific papers, that HLPC is an extraordinarily reliable method for testing for alkaloid content, not just in Kratom, but in countless materials. We’ve been testing for years, we have samples for as far as ten years ago, and we have made it a practice to test that material year after year, on different configurations and any one of our 4 HPLC machines. We want to be 1000% sure of the results we share with our clients, and one of the ways to ensure that is to continually check ourselves, to continually re-run reference standards to recalibrate our machines, and to run multiple tests of the same material at different times and on different machines. We have a supply of pure mitragynine that we purchase in extremely small quantities from a lab supply house on a very regular basis. We use this to generate reference standards to ensure the absolute accuracy of any test we release. HPLC is a light-based system. Every alkaloid from any material has it’s own individual resonance, it’s own fingerprint, let’s say. What this equates to scientifically, is that each individual alkaloid will stick to the inside of a tube called a column and then release at a very reliable and repeatable moment time, depending on the type of column used and the blend of chemistry being used during this testing process. When the alkaloid does release from the column, it then passes over a light source. Each alkaloid reflects in a very different way from the next, and at a different time as well. We can measure and calculate this, and this is exactly what we do. Mitragynine happens to have it’s highest peak reflection point at a very specific frequency of light. When you look at that specific frequency of light at a certain moment in time, you get a “peak” on the visual picture that indicates the presence of that specific alkaloid. That peak looks a lit like a very tall, skinny witch’s hat. Inside that peak is a very specific space or “area”. With a pure reference samples of mitragynine, we know that the area of the peak of light that appears at a specific moment in time will equal 100% mitragynine content. This number os different for each HPLC machine, but it’s a number that can be reliably repeated test after test after test with each machine. This becomes the reference standard for the lab, or the “constant” upon which all other samples are compared against. It takes time and money to continually update this reference standard, but it’s one of those “behind the scenes” things we offer our clients, because we know how critical just 0.10% of a difference can make in the alkaloid content of a sample. We have often tested results from other labs, and what we’ve seen, more than rarely, is that other lab results often come back higher than ours. It doesn’t mean our results aren’t accurate, but we were curious why this actually might be. As mentioned earlier, with some help of a very kind and patient client, we decided to run an experiment where we took 10 samples from 10 different boxes of the exact same strain of Kratom. We also took 10 samples from within the same 25kg box of Kratom. We’re currently running those tests and will compile them soon. Is it possible that there can be as much as a 1.0% difference between boxes of the same harvest and/or the same strain? Is it possible that there can be a big difference in alkaloid content between the exact same material within a single box of material? These kinds of questions exictes me to no end, and I’ll publish those results as soon as we’ve completed the testing. From the European Monitoring Center for Drugs: Regular chromatographic and spectroscopic methods are standard testing methods for Kratom and its alkaloids. Phylogenetic testing of kratom samples by specific DNA nucleotide sequences can also complement the phytochemical analyses. For tests that come up positive for mitragynine, to confirm that the alkaloid is what it appears to be, we spray it with a modified Ehrlich’s reagent which gives mitragynine purple spots. We’ve tried this on numerous samples of both Mitragyna speciosa and supposed Mitragyna Javanica. We have not yet had a false positive, especially when compared on a multi-sampled sample. Kratom alkaloids can be separated by thin layer chromatography on silica gel plates with detection by UV (254 nm). The UV spectrum of the methanol solution of mitragynine shows a maximum at 225 nm with shoulders at 247, 285 and 293 nm. The UV spectrum of the ethanol solution of 7-hydroxymitragynine shows a maximum at 220 nm with shoulders at 245 and 305 nm. We’ve also had clients who have blended their Kratom with other things, such as citric acid, other herbs, and have wondered (mostly when the alkaloid content comes up much lower than they had expected), if there is something blocking the test from giving an accurate result, or if the method itself is not suitable for testing a blended material. Being the nerdy and curious creatures we are, we have spent a great deal of time adulterating and blending various forms of Kratom in our lab. We’ve made pure ethanol extracts into liquids. 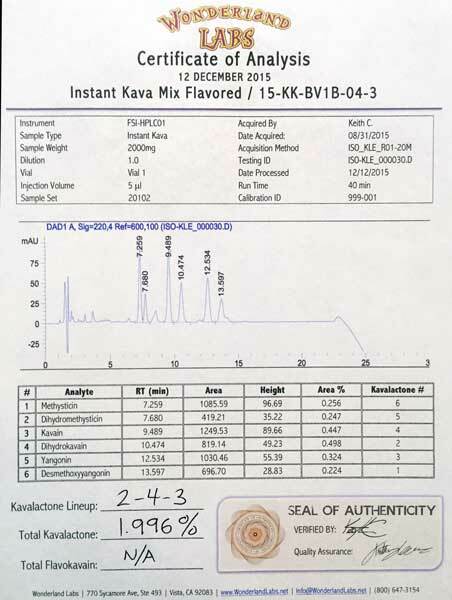 We’ve taken those liquid Kratom extracts and have tested the alkaloid content. We’ve then added large amount of things like citric acid to that liquid, and then re-tested. Every single time, we come up with the same result and the same exact alkaloid content. This isn’t surprising though, because of the way HPLC works. So, bottom line: If HLPC has proven to be a reliable method in the scientific community, if over a dozen published scientific papers have shown that HPLC is a reliable and repeatable method for testing alkaloid content in Kratom, and if our multiple tests trying to prove the testing is NOT accurate have failed, then we are quite confident with continuing to offer HLPC testing as our main testing method for Kratom and numerous other samples that arrive at our lab. A few have asked if we would be willing to try to develop a Gas Chromatography method for detecting alkaloid content in Kratom, and as of this writing, this is definitely something we’re interested in exploring. We’re currently researching, looking for reliable, peer reviewed studies that have been published using Gas Chromatography as the testing method for detecting mitragynine and 7OH in Kratom. We want to provide as accurate results as we possibly can, time after time, and at Wonderland-Labs we’re always open to improving on any results we get. My passion runs deep for the Kratom community, and this is my beacon; it’s my way to give back to a plant and a community that has given me so much.